Over the years Hak’s has become a household name with 3 million in sales last year. The motto of the company is “Life is Short. Eat it up!” This explains Hakman’s passion for food. Back in 2011, Sharone Hakman founded Hak’s BBQ. However, Sharone’s passion for food and grilling dates back even further. He was always considered a passionate cook. Sharone’s life changed when he participated in the first season of Master Chef. He won the show with his secret weapon which also impressed the most difficult food critics and one of the top chefs in the world, the Gordon Ramsey himself. Following the success of the TV reality show, Sharone decided to pursue his passion for food, and started his own company, leaving behind his career in finance. It was not so easy. But Sharone’s determinations to follow his dreams helped him to achieve success in the food industry. His motto always was to make high quality, clean ingredient sauces. He got to train with some of the best chefs in the world, and work in the kitchens of world-class restaurants. One of his specialties is that his dishes are very versatile, mostly because of the sauces he created with such love. 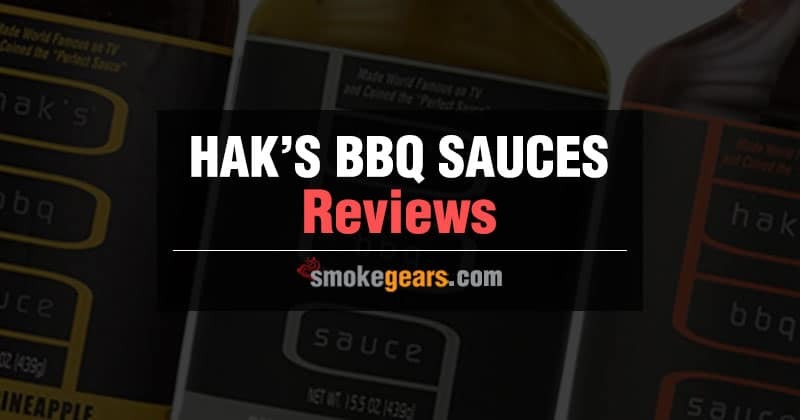 In this section, I have reviewed three popular Hak’s BBQ sauces. I have tried them all and absolutely loved them. The sweet tropical flavored sauce offers both sweetness of pineapple, and blast of heat of the habanero. Flavor of pineapple doesn’t overpower the presence of tomato puree, rather creates a balance in terms of flavors. A combination of heavy molasses and perfect heat is just “wow” in one word. This gluten-free sauce doesn’t contain any preservatives or GMO. You can store in a freeze after opening the container. It received good reviews from the users online. All natural sauce contains- natural smoke flavor, molasses, tomato paste, garlic, crushed pineapple (pineapple, pineapple juice), water, tapioca starch, apple cider vinegar, Onions, habanero mash (habanero peppers, salt), caramel color, and Salt. One of the best barbecue sauces by Hakman. This all natural sauce is great on everything and anything such as beef, chicken, pork, and vegetables. It can be also used a dipping sauce, and with sandwiches. This 15.5 oz container of Smoked Maple Mustard contains a perfect blend of whole grain mustard which gives tangy flavor. You can buy this sauce from the supermarket or order it online. Like any other Hak’s sauce, this great barbecue sauce also doesn’t contain any preservatives or GMO, and it is gluten-free. It is really an affordable sauce at a reasonable price range. Smoked Maple Mustard contains a number of ingredients which are: salad mustard (mustard seed, salt, turmeric spices water, vinegar,), molasses, maple syrup, natural maple flavor spices, water, sugar, onion powder, natural smoke flavor. This sauce was actually created during the days of Master Chef. Gordon Ramsay described it as “the best sauce he's ever had." This high-end, and custom barbecue sauce, bring together seven smoked and roasted chilies with a bourbon bite. The company makes sure that the signature sauce contains fresh, high-quality ingredients. The sauce is non-GMO, gluten and preservative free. Besides, serving the sauce with various food items, you can use it as a marinade. You can also use the sweet and smoky sauce as dipping sauce for chicken fingers or mozzarella sticks. This great sauce is consists of molasses, tomato paste, vinegar, apple cider water, tapioca starch, chipotle powder, ancho chili powder, onion powder, garlic, and salt. The list of ingredients also includes spices. Bourbon alcohol, caramel coloring, natural flavor, and smoke flavor. Most of the experienced pit-masters believe that molasses and pork are a great combination. Thus, these sauces are a good element for any recipe that has pork ribs. When I tried the chipotle bourbon for the first time with ribs, I was blown away with the results. Since then, it is my go-to sauce for any sort of grilling or smoking cook-out. The sauces go well with beef or chicken as well, depending on the recipe. Don’t forget it was barbecue sauce smothered steak which impressed 500 Marines at Camp Pendleton and secured Sharone’s place in the top position in the competition. Hak’s BBQ Sauce is another name of inspiration to learn how to turn passion into a profession. Started as a start-up, the company has become a national brand that offers barbecue sauces, marinate sauces, and salad dressings. According to a survey, Hak’s sauces are sold in over 12,000 retail stores around the US which also demonstrates its popularity. I have tried Hak’s collections of BBQ sauces, and I must say it was worth the price. I would highly recommend giving it a try-you are not going to regret your decision, rather order more of these sauces.